Once you see the magical place called Australia, you will remember it forever. Tourists can enjoy vast white beaches, spectacular open spaces, ancient rocks, waterfalls, mysterious forests, and great cities. Let’s not forget the incredible animals that live there! And the locals are so kind and hospitable. We at iBuzz put together a list that will show you this country in all its astonishing beauty. Maybe someday when you are planning a visit to this unique land, you’ll find this list useful. Sydney Opera House is considered to be one of the greatest examples of modern architecture. The unique ‘shells’ have also become an iconic symbol of the continent. It’s the biggest bridge in Sydney and one of the biggest steel arch bridges in the world. There is a museum and an observation deck, Pylon Lookout, in one of the towers of the bridge. Visitors can enjoy spectacular views of Sydney Harbour and the city center from the top of the pylon. These massive cliffs are located in the Port Campbell National Park, close to the Great Ocean Road in Victoria. Australia is famous for its amazing waterfalls. Among them are the incredibly beautiful Russell Falls and the multi-tiered Mitchell Falls. But not everyone knows about the unique phenomenon of horizontal waterfalls. They can be seen within Talbot Bay, where there are two ridges running parallel, approximately 984 feet (300 meters) apart. Through them a massive amount of water is pushed by a tidal wave, creating temporary waterfalls. Adults and kids will have a great time here! Nature reserves and national parks occupy a third of the continent. 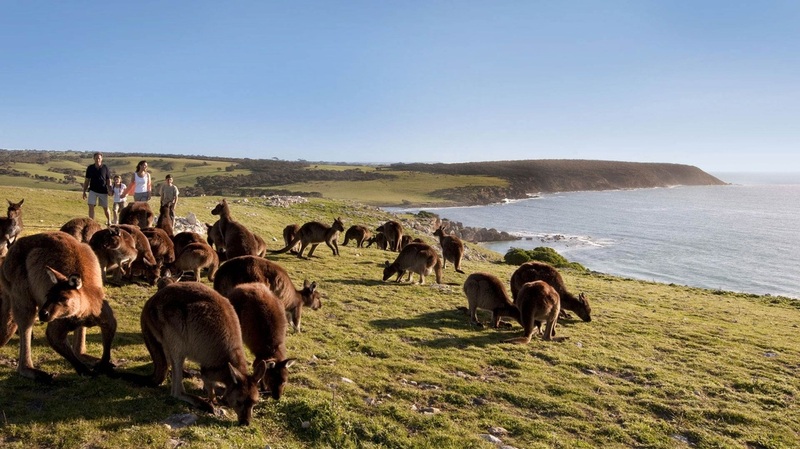 Among the huge cliffs and green valleys you can meet lizards, koalas, platypuses, little penguins, barn owls, and, of course, kangaroos. You can also watch dolphins and seals frolicking in the ocean. In addition to the picturesque views, you can also watch the busy life of the local inhabitants. Wallabies are jumping next to tourists’ tents, flying foxes are flying around, and dingos are howling somewhere afar. And amazing adventures are waiting for you — try the Katherine Gorge cruise and a walk to the Butterfly Gorge. It’s probably hard to believe, but scientists claim that Uluru is 680 million years old. The orange-brown cliff is located in central Australia. Its length is 2.2 miles (3.6km), its width is about 2 miles (3.2km), and its height is 1,142 feet (348 meters). The site includes many caves that have ancient rock paintings. Tourists can also watch the natives performing rituals there. Lake McKenzie is a beautiful perched lake that is considered to be one of the clearest lakes in the world. Another famous lake is the pink Lake Hillier. At the beginning of the last century, the lake was used as a source of salt for six years. This year during the Extreme Microbiome Project, scientists found out that the microalgae Dunaliella salina is the reason for the lake’s pink shade. The largest city in this region is Adelaide. South Australia is famous for its wonderful vineyards and colorful scenery. Here you can relax on Glenelg’s sunny beach, try delicious seafood, and taste amazing wines like Chardonnay, Cabernet, and Pinot Noir. Australian aboriginal culture claims to be the oldest continuous living culture in the world that has preserved its ethnicity. There are 250 language groups and over 700 dialects in the country. Old local legends tell of the ‘dreamtime,’ which is reflected in stories, handicrafts, dances, and songs. The most famous and important character of the mythology is the Rainbow Serpent. It takes up to 3 or 4 hours to explore this huge aquarium. Sydney Aquarium is split into several themed zones: ‘Northern rivers,’ ‘Southern rivers,’ ‘Great Barrier Reef,’ and ‘Southern Ocean.’ There are 3 giant floating oceanariums, 27 big display tanks, and 23 aquariums. The range of exhibits is absolutely fantastic! Bright fish floating among the corals, saltwater crocodiles, sea turtles, seals… Enchanted, people walk through glass tunnels as toothy sharks glide slowly above them! Tourists can enjoy lovely walks along the white sand beaches and taste wine and gourmet dishes. You can take an unforgettable treetop walk that features a stunning walkway positioned 131 feet (40 meters) above the ground. Here you will get a magnificent view of the giant 400-year-old trees. The Pinnacles Desert is a special landmark of Nambung National Park. Thousands of huge limestone pillars rise out of yellow sand dunes. So far, scientists haven’t been able to puzzle out the mystery of this place. They think that the rocks were created by natural elements: water, earth, fire, and air. By the way, wildflowers bloom here from August to October. The name ’Blue Mountains’ is derived from the blue haze that hovers above the mountains, produced by the oil from the Eucalyptus trees. The area is dissected by canyons and gorges up to 2,490 feet (760 meters) deep. And down in the forests, there is a giant mystery stairway that provides a spectacular entry to the Jamison Valley. Perhaps you’ve dreamed of a wonderful drive along the coast of the Pacific Ocean? Well, you can fulfill your dream by traveling the Great Ocean Road. It’s located in the state of Victoria, and its length is 151 miles (243km). The scenic highway mostly follows the coastline, but sometimes the road runs deep into the mainland, where you can enjoy the vineyards and rain forests. By the way, the road is covered by a 50 miles per hour (80km per hour) speed limit. There are over 340 species of animals in the famous Taronga Zoo. You can get there by ferry from the city center. There are also other zoos in Australia: Perth Zoo, Melbourne Zoo, Healesville Sanctuary (housing only Australian animals) in Victoria, Adelaide Zoo, etc. But observing animals in their natural environment is definitely more exciting! Vivid Sydney is a lighting festival that takes place in Sydney in the beginning of winter. By the way, have you forgotten that winter starts in June in Australia? The lights and installations of Vivid Sydney illuminate some of Sydney’s most iconic landmarks. Sydney Opera House, the Cathedral of the Blessed Virgin Mary, the University of Sydney, and the Royal Botanical Gardens are all featured in the festival’s program. This year the theme of the show was the culture of Australian indigenous people. Broome City, which is located near the Indian Ocean, is truly amazing. Here you can experience exciting camel rides along the beautiful white sands, visit the Argyle diamond mine, and enjoy the breathtaking views of the King George Waterfalls and the Mitchell Plateau from a helicopter. The Great Barrier Reef is a coral reef system composed of over 2,900 individual reefs and 900 islands located in the Coral Sea. 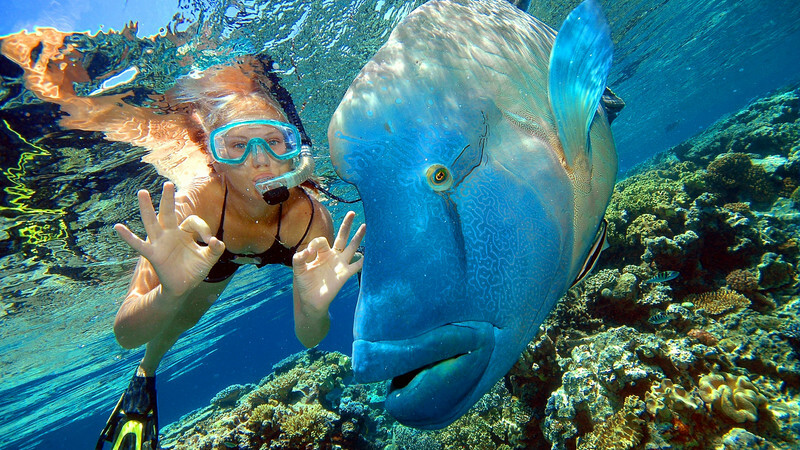 The Great Barrier Reef stretches along the northeast coast of Australia for 1,553 miles (2,500km). It’s the world’s biggest natural feature made by living organisms, and it can also be seen from outer space. The fauna of Australia is unique and incredibly diverse. There are more than 200,000 species of animals! Most mammals on the continent are marsupial animals, and the mothers have a pouch where they carry their little babies. It’s impossible to name all the inhabitants, but even children, while talking about Australia, always mention cute koalas and funny kangaroos.